Promoting fresh, local and healthy food to students, teachers, parents and the community is the best way to ensure the healthy food you are serving gets eaten. Below are resources and tips to promote your work and get kids excited about their food! Weekly Local in the Lunchroom Announcements: Every Monday, share with students, teachers and staff what local food is being served that week. This can be shared in a morning announcement or in a weekly assembly, depending on the school culture. Remember to share about the farm and farmers the products came from and how those products are being incorporated into the school lunch menus. Annual Farm to School Kick-Off Assembly: At the beginning of each school year, kick off your program with an assembly. Include faculty, food service staff, farmers, distributors, extension agents, Farm to School coordinators, parent volunteers and students to bring excitement to the program on an annual basis. For themed event ideas that compliment Farm to School and other nutrition events check out the Team Nutrition Popular Events Idea Booklet. Farm to School Bulletin Board: Create a bulletin board featuring photos, farmer stories, recipe ideas etc. and display the board in an area where students will see it. Farm to School Display Board at School Events: When there are school events (parent conferences, teacher in service days, school plays, holiday parties) raise awareness about the work you are doing and showcase your Farm to School program with a display board. Be sure to include photos of students trying the healthy, local foods! Farm to School Presentation: Prepare a presentation about your Farm to School program and share it with different audiences whenever possible. Plan to give your school board an annual update - it will help give them, along with parents and community members attending board meetings, a better understanding of what goes into a successful program. This is how you build support for your work and your program. (See Farm to School Timeline and Planning Tool for Food Service). When Someone Asks "What’s New?" – Say Farm to School! Word of mouth is one of the oldest and most effective methods of promotion. Be an advocate for your own program and tell others what you are doing to bring fresh, healthy local food into your meal program. Taste tests are small samples of food, served separately from lunch, that introduce a food’s flavor, texture, and smell. After the sample has been offered, students vote on whether they tried it, liked it and if they would try it again. The most effective taste tests involve a hands-on learning component about the food item they tasted. Why Are Taste Tests Important? Children can be picky eaters and most will want to try a bite of something before they commit to an entire serving. Taste tests familiarize children with new foods, which helps to ensure that an item is marketable before it is offered on the menu. Children, food service and the school can be proud in promoting that they are a school that tries new foods. Pinpoint what your goals are for holding a taste test. What do you want to accomplish from holding a taste test? Are looking to expand your salad bar offerings? Do you want to develop your menu or grow your Farm to School program? Knowing your goals will guide you in deciding what foods you should offer in the tasting. Taste testing can be a labor intensive process for one person. It is best to form a team that will help with all parts of the taste test (food preparation, food service, nutrition education, survey tabulation, etc.). People to consider having on your team: food service director, school head cook, supportive teachers, interested parents, and the custodial staff. Be careful about soliciting assistance without adding excessively to their workloads. How many taste tests will be conducted? What foods will be tested? Where will products be purchased? Where and when will the taste tests be conducted? Who will be responsible for purchasing, preparing, and serving the foods? Will nutrition education be part of the activity - who will be responsible for providing it? Studies show that students who help prepare a food for a taste test are more likely to try it and like it than those students who have not. As a team, consider how to provide students the opportunity to participate in the food preparation. Once your team has figured out the details for your taste test, communicate your plan with the school and the community. You want to make sure you are choosing dates that work for the entire school. Planning a taste test on a day when half of the students are on a field trip is not the best idea. As a team, work together to ensure the principal, teachers, food service staff, and custodial staff are aware of the taste test activities so there are no scheduling conflicts. Bright Ideas for Taste Test Success: A video by Georgia Organics on how to conduct a successful taste test. Home Grown Taste Test Guide: A detailed guide for food service on developing and implementing a successful taste-testing program. 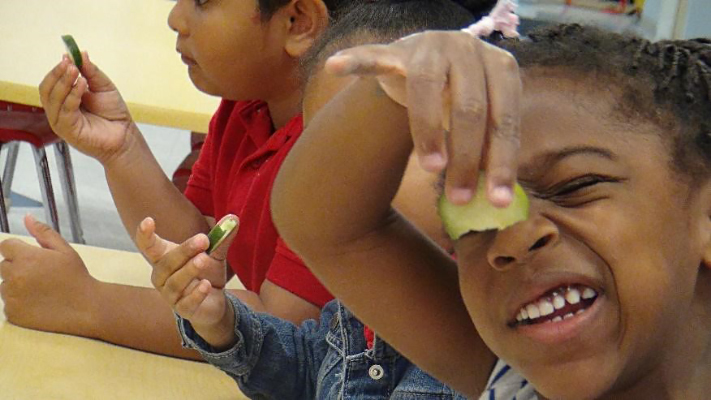 A Guide to Taste Testing Local Foods in Schools: A comprehensive guide to conducting taste tests, developed by VT-FEED. Free Tasting Lessons: Free and fun bilingual produce tasting lessons, from Cooking with Kids, Inc.
Louisiana Harvest of the Month Program: This site contains promotional posters, editable parent and teacher newsletters, social media graphics and promotional materials (Developed by the Louisiana State University Agricultural Center). Ag in the Classroom: This program works to increase agricultural literacy among children and the general public through free tools and resources for more effective teaching about agriculture and its role in an interdependent society. Harvest for Schools: This site consists of promotional posters, editable parent and teacher newsletters and common core based curriculum connections for ECE, elementary, middle school and high school showcasing a variety of fruits and vegetables (Developed by Oregon Department of Education). Team Nutrition Editable Promos for Schools: This document includes promotional templates for community members, parent/guardian, and other schools and a sample press release. National Farm to School Month Promotional Materials: The National Farm to School Network has resources and materials for National Farm to School Month in October including fact sheets, annual communication toolkits, printable posters and stickers. National School Lunch Week: National School Lunch Week (NSLW) is a yearly celebration of the school lunch program and an ideal time to promote your Farm to School program. Food Service teams throughout Louisiana are working with their schools and communities to engage students in Farm to School activities. Below are highlights from schools across the state. If you have a nutritional education or outreach activity that you’d like to share, please send an email to the Louisiana Fit Kids File Drop with a link to an article or information and photos about your program.